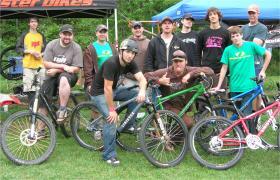 It is our great pleasure to announce that the 3rd Annual D-Day Mountain Bike event, held on June 13, 2009, was a big success for the Lynn Woods Reservation. The event generated $750.00 to help support the trail network. Despite the cold rain-soaked week, D-Day was blessed with one day of perfect sunshine. Thanks to the weather we were able to pull off a full day full of events, games, group rides and demo equipment. This year we had a record number of registered participants, totaling over 150; double that of last year. Along with this record number of participants came a record amount of funds generated for Lynn Woods totaling $750.00; a 50% increase over the 2008 D-Day Event. The event opened to the public at 9:30am with the first group ride of the day-for advanced riders led by our own Pete Slabysz at 10:00am. This first ride drew over 20 participants and covered many well known (to the mountain bike community) trails including Shark's Tooth, Espresso and Pow-Wow. Group rides were in high demand during the morning hours. There were four scheduled group rides of varying levels, as well as a number of 15 minute demo rides throughout the course of the day. Two additional trail group rides were added due to popular demand. The afternoon session of games and trials show commenced at 1:00pm at which point the ball field was still overrun with attendees! This year we were proud to introduce a new series of mountain bike games and contests to interested participants. Games included mountain bike limbo (ride your bike under the limbo bar, which gets lower with every round), team wheel-toss, an obstacle course and the high jump contests. Games were available for attendees to compete in and interested parties to watch. Prize packs were of course awarded to the winners. The high jump contest was absolutely the crowd favorite with over 20 contestants jumping their bikes over a bar using an 18" launch-ramp. The contest began with the bar set at 24" above the ground. At each round, the bar was raised 2", narrowing the field of contestants to one winner. At 40" the field of contestants was eliminated to all but two riders, who drove the bar height past 50" (4 feet above the ground). Bill Ward (Western Cycles) won the contest at a height of 54" eliminating Tom Brownlie (Dieselbikes Rider) and setting the first high jump record for our event. 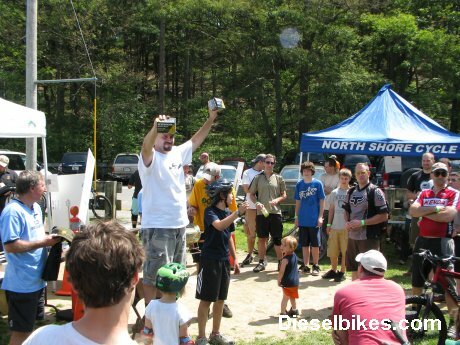 This contest was loved by all and is expected to become a staple competition at future Dieselbikes events! Food and drink concessions were extremely busy all day with the smell of hamburgers, hotdogs, sausage & peppers and homemade meatball subs filling the air. Eric, Doug and Ken manned the grills at lightening speed, keeping the flow of hungry mountain bikers moving throughout the day. The Mountain Unicycle crew was back for their third appearance at D-Day hosting a MUni trials competition and learn-to-ride clinics throughout the course of the day. There was a record number of MUni riders attending this year and the variety of unicycles on hand was vast ranging from 19" to 32" wheels. Jeff Putnam of MountainUni.com was the organizer and lead rider for these one-wheel trail rides. MountainUni hosted learn-to-ride clinics designed for individuals who have never ridden a unicycle before, but who were willing to give it a try. In addition to riding around the event field and parking lot, the crew went into Lynn Woods show-casing their talents on trails that even two-wheeled mountain bikers face difficulties riding. One more highlight at this year's events was seven-time, National Trials Champion Mike Steidley. 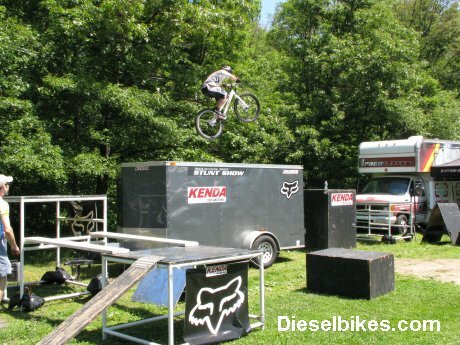 While this was Mike's first tour at a Dieselbikes event, we are sure it will not be his last. 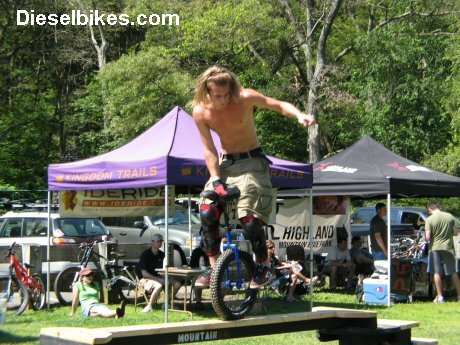 Mike performed the Kenda/Steidley Mountain Bike Trials Stunt show for audiences twice. Showing each time, without dispute, why he has been the National Champion seven times! Mike's body manipulations and his rapid directional change drew crowd pleasing gasps of awe and wonder. To quote Lisa Savage of Quincy: "Mike was amazing and the show was fun to watch". Mike's final display of balance and pin-point accuracy was highlighted unquestionably by his ability to launch his bike, from a stand still, off a 7+ foot height (the top of his trailer) and land squarely on an empty soda can, crushing it flat with just his rear tire & the weight of his body and bike. 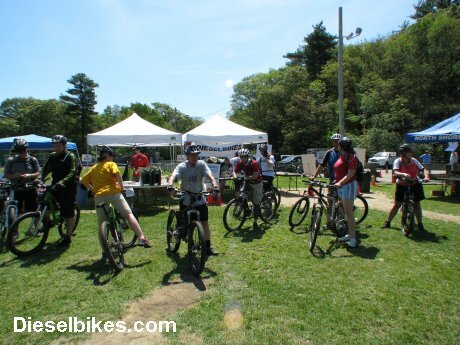 A number of event sponsors returned this year including Sinister Bikes (Gloucester, MA), Western Cycles (Danvers, MA) and Wheelworks (Belmont, MA). 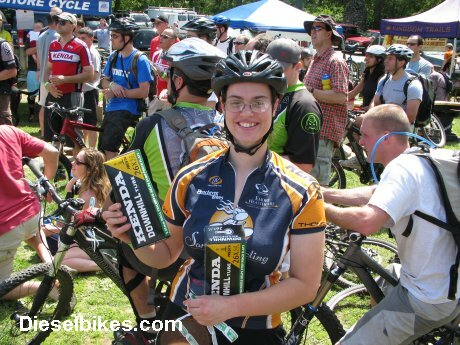 New sponsors for 2009 included Intense Cycles (Temecula, CA), Kingdom Trails (Burke, VT) and Highland Mountain (Northfield, NH). Attending sponsors provided demo bicycles, outdoor equipment and information regarding their services. Lenny Merserve of Belmont Wheelworks was quoted as saying, "The event is great! A good size crowd and plenty of people asking about new bicycles." Product donations and free swag provided by all the sponsors was huge this year. 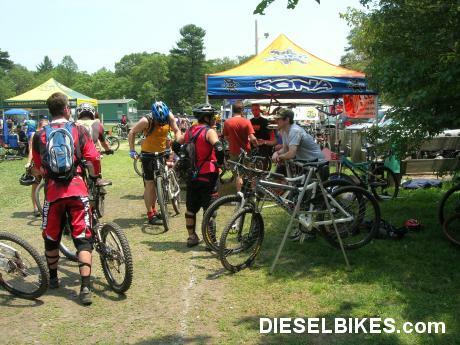 The amount of product given to Dieselbikes for this event far exceeded past events. Kenda Tire & Tube of Reynoldsburg, OH was the lead contributor for the event raffle, while the EMS Peabody Store led the way in free give-aways for the crowd. 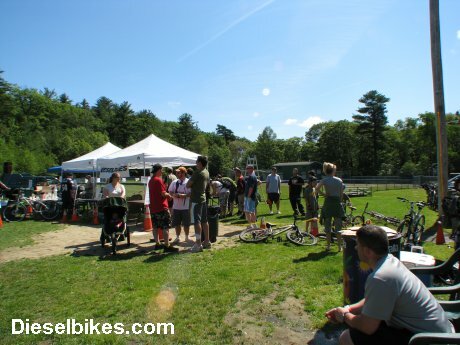 One of the crowd's favorite raffle prizes was a Sunday River Resort one-day mountain bike pass; this was closely followed by the Kingdom Trails Association's park pass. Dieselbikes wants to thank each of our sponsors for their generous product support and looks forward having them back next year. We could not have had such a successful event without the generous support of each of our vendors! 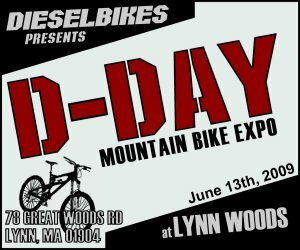 The 3rd Annual D-Day Mountain Bike Expo was truly a successful event not only for the Lynn Woods Reservation, but for the bicycling community as a whole. This event combined well over 150 cyclists and their families for a day of riding, fun, competition and social activities. The help we received from our staff of volunteers is commendable. Without their help, this event would have not run so smoothly. 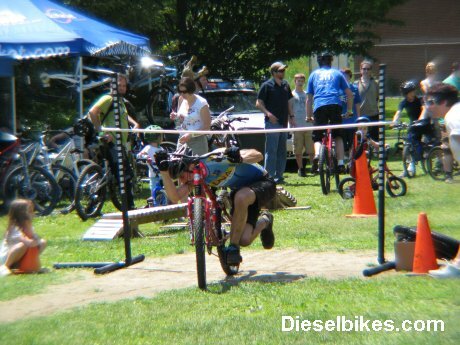 Dieselbikes looks forward to its next social cycling event: The Spookbikecular Halloween Mountain Bike Festival scheduled for Saturday October 31st! We also plan on bringing D-Day back for its 4th year with bigger and better events & activities. Once again, we would like to thank everyone who attended the D-Day Expo, and give special thanks to our volunteers and sponsors, without whom we could not have made the day what it was. We look forward to working with them at all of our future events! Diesel Day June 13, 2009 from Wesker on Vimeo. The Event Schedule is now available! Download a copy by clicking here (PDF format) and see the times and venues occurring during this great mountain bike event! We are happy to announce 7x National Trials Champion, Freerider and Stunt Rider Mike Steidley will be attending D-Day to perform his Kenda/Steidley Mountain Bike Stunt Show presented by Haro Bikes. Click here is see videos of Mike in action! What was the D-DAY EXPO? The D-DAY Expo is an event that will showcase the latest products, technologies and services in the fast growing world of mountain biking! 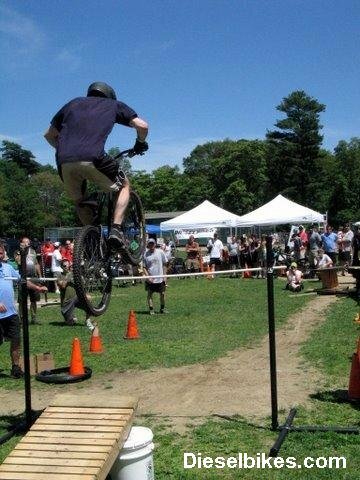 Our goal is to expose event attendees to everything that is mountain biking in a fun and friendly outdoor atmosphere while we generate funds to support trail maintenance programs in Lynn Woods. Demo bikes, displays of the latest equipment, apparel and accessories all will be available for event attendees. Speak directly with factory and local business representatives regarding their products and services. Participate in contests, group rides and watch professional demonstrations throughout the event. The D-DAY EXPO will have something for EVERYONE! The D-Day EXPO is an event designed for cyclist of all levels who share a passion for this sport. This event will include exhibits with merchandise, product demonstrations and rider skill clinics designed for the mountain bike junkie. With a combination of new products and expert advice from industry representatives the D-Day EXPO can inspire any mountain biker with countless ideas to enhance their skills, update their equipment and revitalize the passion for this sport. Whether you�re a beginner to mountain biking or someone who been in the sport for years, anyone with in interest to update, enhance and better their riding skills should attend this social event that is fun for both friends and family. This event provides a method to help generate money and awareness for Lynn Woods Reservation located in Lynn, Massachusetts. Part of the proceeds collected from ticket sales and the event raffle in conjunction with attendee / sponsor donations, will contribute to the Park Ranger Fund. The Park Ranger Fund is the monetary engine that maintains Lynn Woods and allows field maintenance programs to exist. Event 411 - New exhibits, sponsors and venues are continuously signing up and will be added to this list below shortly. - Event Admission: $5.00 - Includes Event Insurance. Sponsoring exhibitors will have bicycle demos product information and component demonstrations available onsite. Product sales during the event will be at the discretion of the sponsor. Dieselbikes and/or event sponsors will not have the ability to accept credit cards or debit cards at this time. Dieselbikes can accept CASH and/or Personal Checks as a method of payment. We apologize for any inconveniency this may cause. All attendees are required to sign event wavier forms prior to entering into this event. Under 18 must be signed/accompanied by a parent with proper photo ID. Each sponsor will have requirements for proper photo ID and completing waiver forms before riding any demo bike. Riders under the age of 18 must be accompanied by a parent with proper photo ID. Availability of demo bike is on a first come first serve basis.